‘We are surrounded by symbols. They are present in every facet of our existence. At a practical level, they point us in the right direction, they issue caution, they give us choices, and they limit our choices. Symbols are necessary to navigate through life. Imagine driving in the city without symbols. Chaos would reign. Symbols have meaning. Meaning is a part of their nature. Road signs are symbols with simple meanings. Some symbols have deeper meaning. They are a powerful gate to the deeper and less conscious levels of human experience. Symbols evoke profound emotions and memories—at a very primal level of our being—often without our making rational or conscious connections. They fuel our imagination. Symbols enable us to access aspects of our existence that cannot be accessed in any other way. Symbols are used in all facets of human endeavour. In a therapeutic relationship, use of visual images can assist a client to get in touch with otherwise inaccessible personal realities, thus enhancing the possibility of creative conversations and deeper exploration of experience and meaning. Much of what we take to a therapeutic encounter is unknown to us. We feel something but may not be able to give voice to it. To find a symbolic representation of our experience can open the way to powerful explorations of that experience and to transformative encounters. In artistic work, symbols are often the first encounter with emerging creative possibilities. The emergence of something new is often experienced non-rationally or non-verbally. Symbolic representation may be the only means of expression available to certain experiences. Describing, and scientifically explaining, a sunset does not usually evoke the same intensity of experience as seeing it. A painting or theatre performance can convey the felt reality of being a refugee more powerfully than rational argument. Gestalt Therapy uses artistic approaches and images as a means of increasing awareness of personal experience and exploring personal meanings. The word Gestalt means ‘figure’ or ‘whole’. 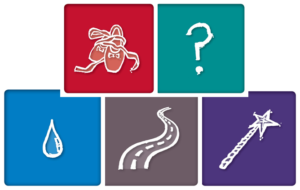 The symbols presented to us in this resource are simple figures that are evocative and have the power to link with the complex figures in our own experienced world. Symbols can be of essential practical use and alert us to issues of safety. They can represent our allegiance to our tribes and groups. They can also express our search for purpose and fulfillment. 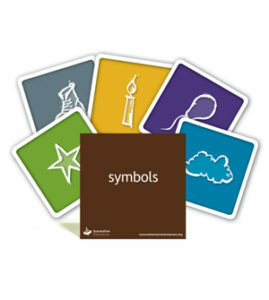 Published by Innovative Resources, the Symbols card set contains 100 visual images from a potentially unlimited range of symbols. You will find a mixture of different types of symbols. Some are archetypal in a psychoanalytical or existential sense. Some are the sorts of images you might expect to see on street signs. Some may be a mystery to an observer who is unfamiliar with the cultural relevance of that particular symbol. Ultimately, everyone who uses Symbols will construct their own meanings around each of the 100 images. Everyone will have their own unique preferences and everyone will think of other images they would have included in such a set.